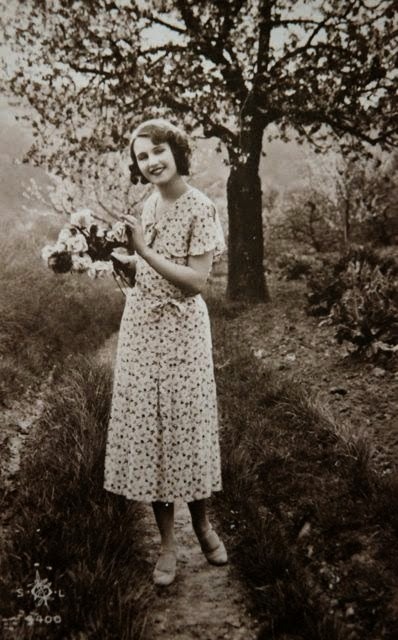 This is actually something I worked on before I went on holiday: the second installment of my Vintage Pattern Pledge, a 1930's dress from an unprinted pattern. I already blogged about it here, when I was just getting started. In that post, I already mentioned the absence of grain markings and the tricky tucks which form the shoulder yoke. The rest of the dress was rather simpler to put together. There were no markings anywhere for closures though and no instructions about that either. I quickly noticed that the neckline would definitely need some kind of opening though, so I kept the center back of the yoke unstitched. When I first tried the dress on, I still needed to make some more room to fit my head through. I might look like a sort of mid-depth square neckline in the drawing, the reality is very high indeed. 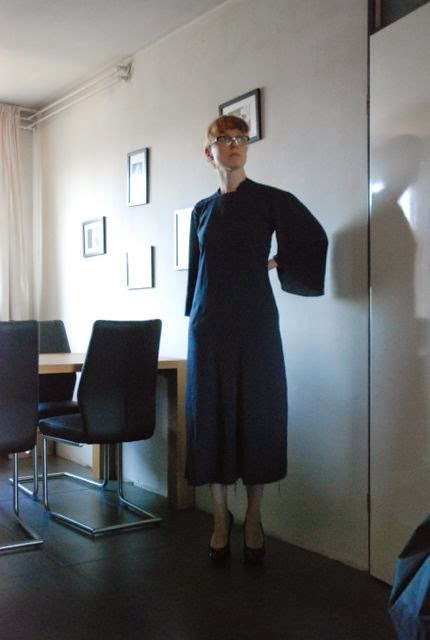 Of course, the dress is still unhemmed, the sleeves would need pleating in at the bottom and the neckline still has to be finished. But why bother. It is supremely unflattering. I had high hopes for the styles of the early 1930's because they look so elegant in the illustrations. Even though I know I am the wrong shape for this era. Belting it sort helps with the look although I don't think you are supposed to belt a 1930's dress as tightly as this. I don't particularly feel like trying to fix this. One of my reasons to want to try these old patterns is to get an understanding of the real period shapes. 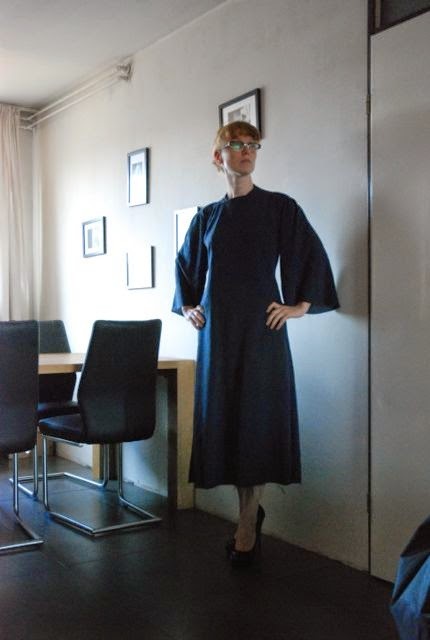 I don't think I could make this dress look flattering on me and yet have it look like a proper 1930's dress. 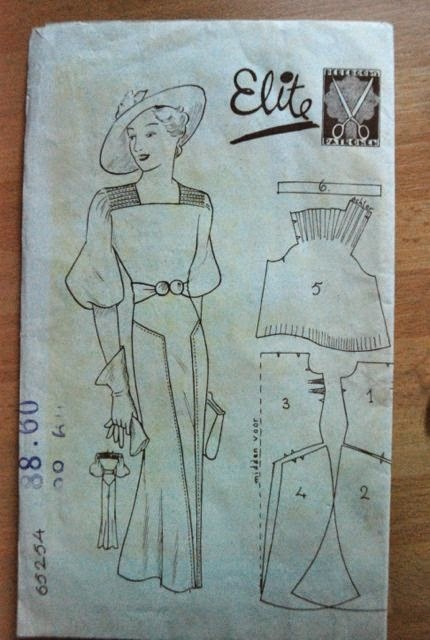 In the mean time, I won't continue working on this dress but I may try another 1930's item from a Gracieuse magazine. At least with those, I'm sure which size the design is meant for. This will be the last post based on my holiday, I promise. There is just this one more thing I wanted to show you and I think you can relate to this: I bought fabric. I know a lot of sewing bloggers make a habit of buying fabric as a souvenir but I have done that before. Most of my holidays just don't take me to places with good fabric shopping. This time, I knew I was going to in Edinburgh on the last two days of my trip, so I googled for fabric stores there beforehand. That way, I found Edinburgh Fabric, which promised a great selection of, among other things, Scottish wool. The store also happened to be conveniently located along the main road between our bed&breakfast and the town center. Tartan. 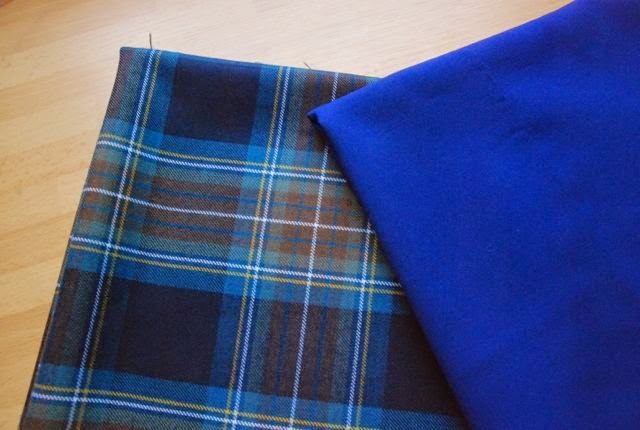 Proper, 100% wool Scottish made tartan. I just had to pick from a large selection of different designs. Having no family links with Scotland myself, there was no obvious choice. I picked this sett purely based on its look and colours (the background is actually a rich blue, not grey like it looks in the picture. It's nearly impossible to photograph fabric properly and the colours of my fabrics are much richer in real life than they look in this picture). It was labeled "Holyrood", which I thought was appropriate because I used to take a lot of long walks in Holyrood Park when I was living in Edinburgh as an exchange student (only for a single semester) years ago. The sett doesn't appear in the book of Scottish Clans & Tartans which I also bought (there are 150 in it) but that would make sense because Holyrood is, as far as I know, not the name of a family or clan. Historically, the Palace and Park belonged to the royal family so it's unlikely that another dynasty took its name from it. That makes it likely to be a fairly modern design made either to celebrate something about Holyrood or just to sell to people like me. The other fabric is a thin wool in a rich bluish purple. I love that colour and because it was in the remnant basket it wasn't expensive. I have 1.5 meter of each, so now I only have to decide what to make with them. Despite the fact that our route didn't take us to any of the historical weaving mills (another thing for my 'next time in Scotland'-list), I did come across something sewing-related. And purely by accident. 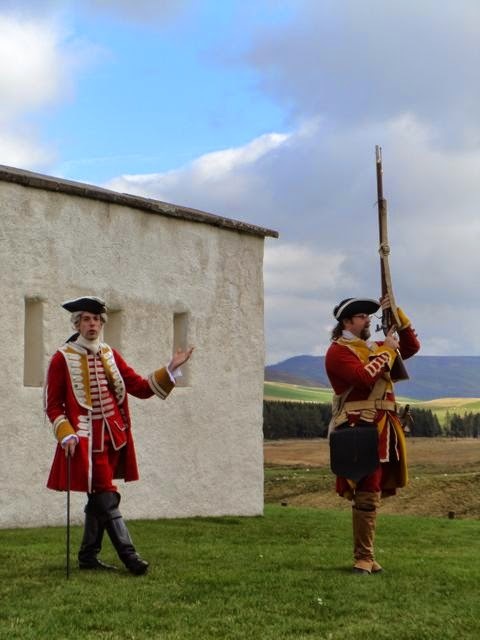 I already mentioned the "meet the Redcoats" event at Corgarff castle previously. What I didn't tell yet, was that we wouldn't even have known about it if the steward at Balvenie castle (which we visited the day before) hadn't mentioned it to us (this small, recently added event wasn't on the event calander. She also recommended the app, which did announce it). 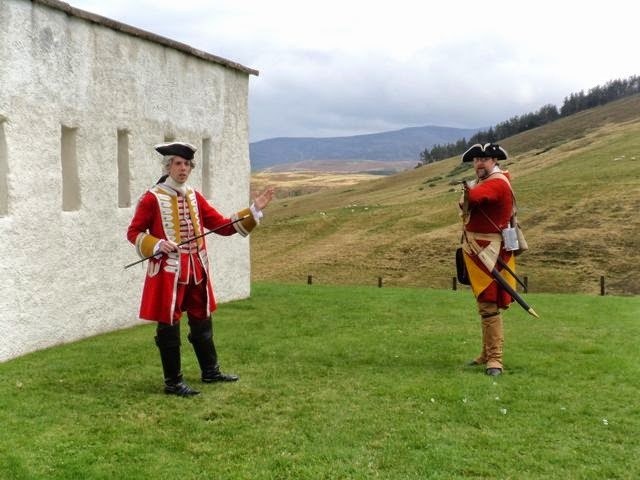 Although the history of Corgarff castle goes back further, it now shows visitors how it would have looked in the 18th century when it housed a small garrison of Redcoats, English soldiers. They had been posted at strategically placed locations throughout the Highlands to keep the population under control after the Battle of Culloden. They all really looked the part and were very knowledgable about their era. Both about the overall situation and about the details of the everyday lives of their characters. And there was sewing. Downstairs, in the officer's room, the lady was making him a casual coat. Unfortunately, I didn't take pictures but we did have a nice chat about period silhouettes and the start of uniform regulations. Then, we went upstairs and met the soldiers in the barracks room. They were happy to show the various tools of their trade and even to let visitors (it wasn't busy, we were the first visitors that day and while we were there, two other couple arrived) handle them. And then I saw one of them sewing. Finishing pocket edges with a blanket stitch, to be precise. So, I wanted to know everything about the uniforms. As it turns out, soldiers in the 18th century would be given uniforms but they had to care for them themselves. To save a bit on the cleaning and mending, they would only wear the full uniform for parades and battle. 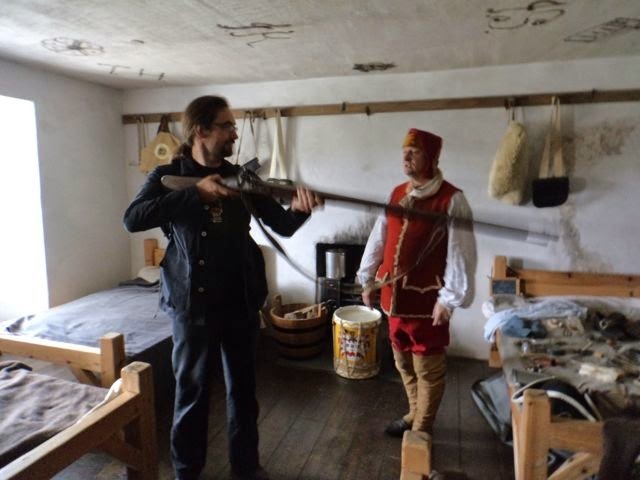 The outfit worn by the soldier in the picture with E and the musket was the normal look at the barracks. These modern reenactors however make their own uniforms (not everyone has all the skills necessary of course, so people may make things for each other). This particular gentleman couldn't only sew, he'd also learned leather working and metalworking. These uniform coats are made from thick wool and lined with the material in yellow. Only the part of the bodice which doesn't show when it's worn is lined in a thinner, cheaper wool serge. The sleeves were lined with muslin but he explained it isn't known whether or not sleeves were lined at all. The coat was carefully tailored to fit him, which is why, as you can see, it doesn't fit E at all. What I found very interesting is the way the coat functions: There are no separate summer and winter uniforms. These wool coats would be worn all year. However, the yellow contrast bits on the bodice can be overlapped and closed for warmth in winter. The same goes for the tails which are normally connected at the corners (with a hook and eye) displaying the contrast lining but cover more when they are allowed to hang loose. I suspect one might sew such the seams which don't show on the outside by machine but this one was entirely sewn by had (he mentioned he had to because his sewing machine broke down). The whole thing is trimmed in distinctive white and yellow tape. Which would always have to be applied by hand anyway. So just imagine how much work must have gone into this coat. 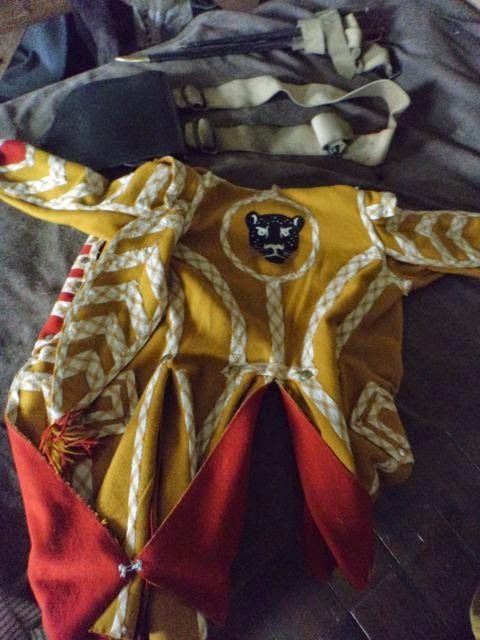 Part of the outfit of the regiment's drummer, the only soldier to wear the regiment's colours the other way round. 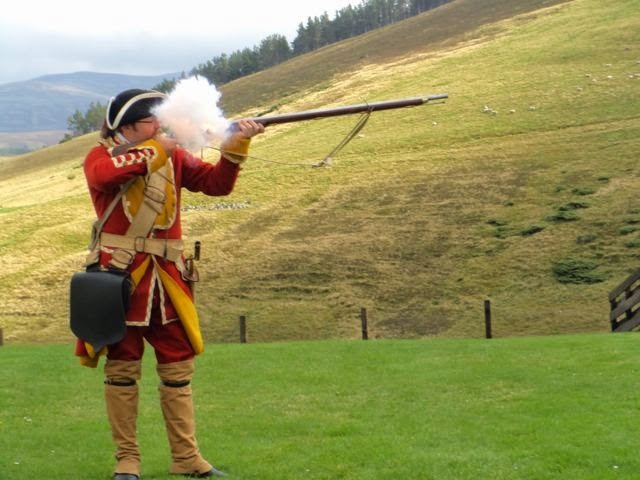 And here is the soldier's coat, worn by its owner and maker, in action. The musket, by the way, is a modern reproduction and they are shooting blanks. The meeting was quite interesting and a lot of fun. We'll definitely try and catch another event next time we travel to the UK. 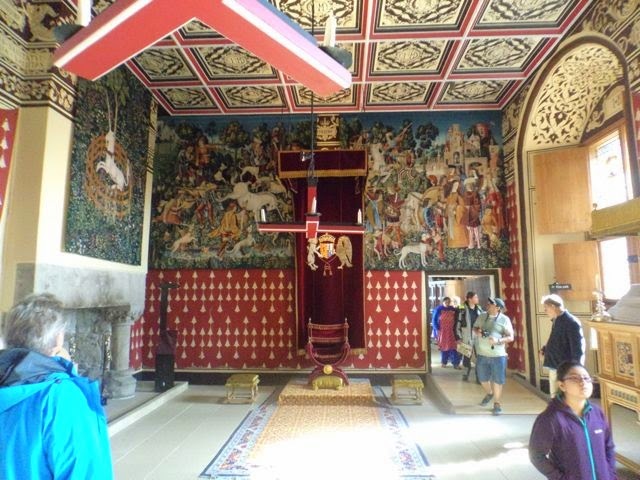 On our first full day in Scotland, we were in Stirling and of course, we visited beautiful Stirling Castle. 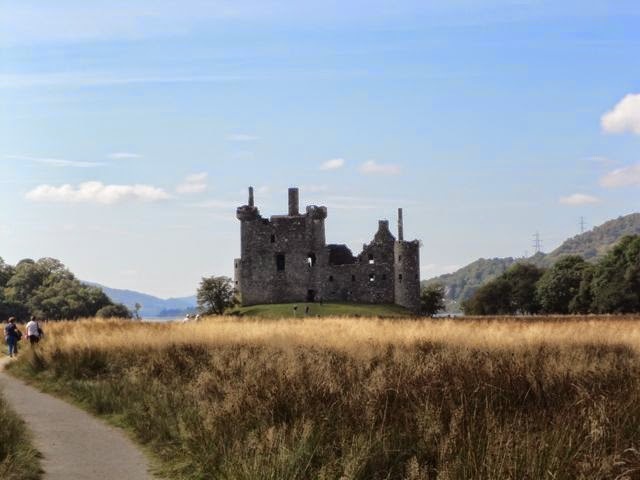 A favorite of Scottish Kings and Queens for centuries (until they also became Kings of England), this castle is still (and/or again) pretty much intact and in size it's second only to Edinburgh Castle. 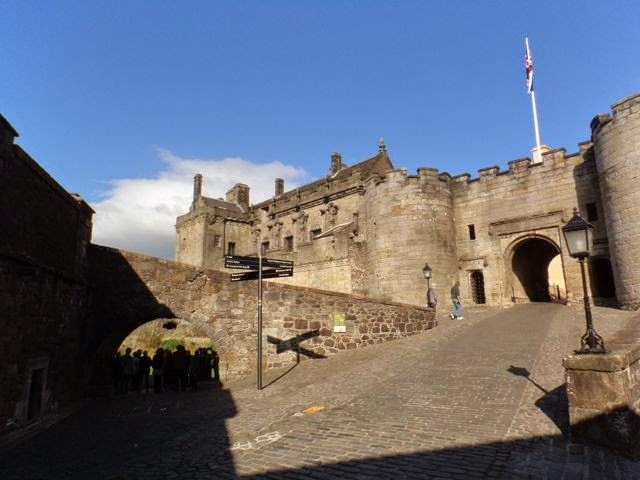 Stirling Castle reached the shape and size it still has today in the reign of James V, the father of Mary Queen of Scots (by the way, while on holiday, I was reading Margaret George's biographical novel about that ill-fated queen. It proved a very good choice because so many of the places we visited had some connection to her reign). And it's not just a stone shell with a lot of stories connected to it. In recent years, a huge effort has been made to restore the royal apartments to how they may have looked in the mid 16th century, when the child-Queen Mary lived there. This means things are more brightly painted and glossy than we're used to, but that is very likely historically correct. I won't go entirely off-topic here and discuss history, the way it is told and perceived or the benefits of or problems with large-scale restoration. I'm not an expert on any of those topics and although I love to talk about such things, I don't expect all of you to enjoy that. This is a sewing blog, after all. However, there was something there which I think will interest you. The tapestries. When I walked into this room, the Queen's Inner Hall, I immediately realized these couldn't be period tapestries. The colours were just too clear and bright and vibrant. The gauge also seemed somehow 'off'. And yet, they were definitely real tapestries, not imitations made by painting on coarsely woven canvas, like I've seen in Neuschwanstein Castle in Bavaria (of course, that entire castle is a 19th century phantasy and imitation of the Middle Ages). The answer came later that day, when we followed the signs to the tapestry workshop (located in an outbuilding). There, two weavers were at work. By sheer coincidence, we were perfectly on time for the weaver's talk (which I believe they only do once a day). She explained the story of the tapestries: As you may know, rooms in Medieval castles were often hung with tapestries for both warmth and decoration. 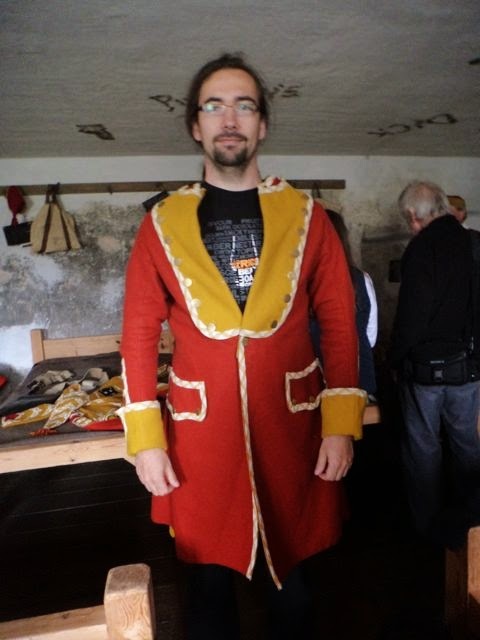 That would certainly have been the case in the royal apartments of Stirling Castle in the 16th century. However, none of the original tapestries remained. 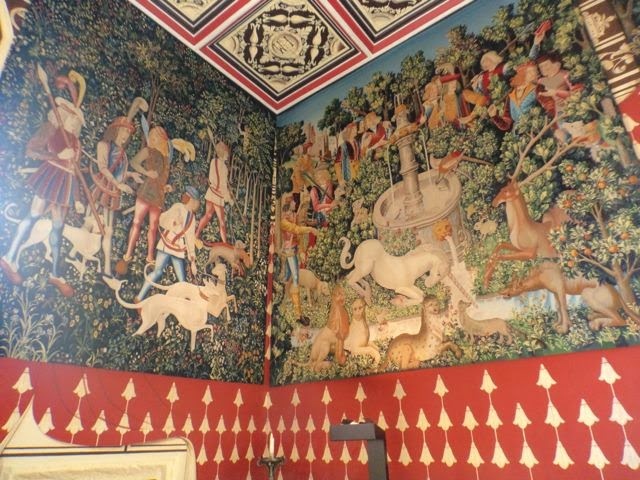 And according to old documents, James V had owned a set of tapestries with a unicorn theme. 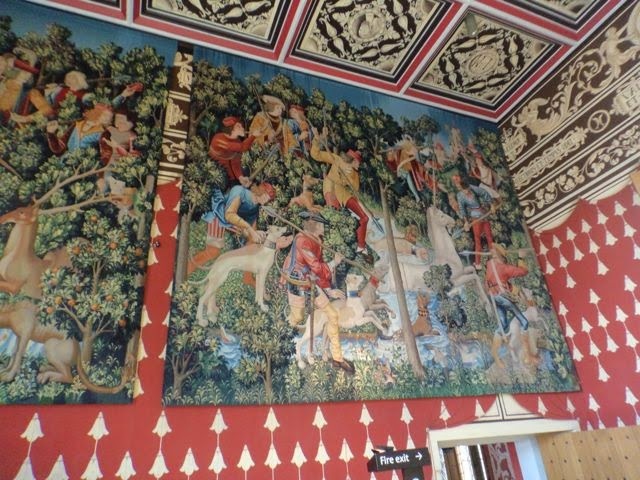 When planning the restoration, Historic Scotland decided to re-create a set of tapestries. 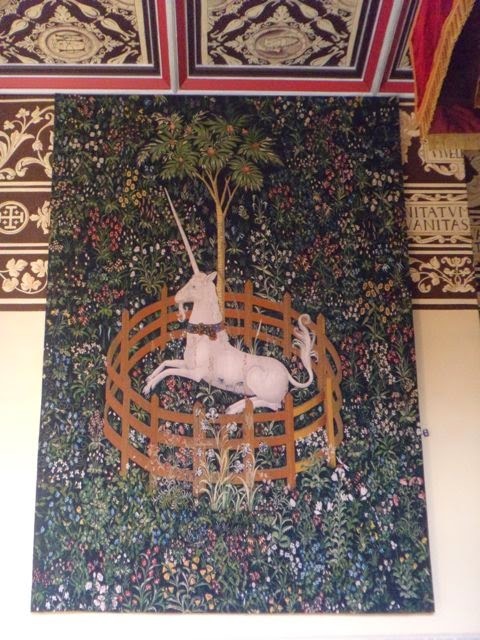 The new tapestries are based on a series which spent most of its history in France (one of only two surviving sets of unicorn tapestries) and is now in New York. It is called "The Hunt of the Unicorn"
The finished tapestries are all copies of those. And I was right to notice the gauge: the original tapestries were woven with threads less than half the thickness that is used now. This had to be done to limit the cost and the duration of the project. The tapestry they are working on now, the last one of the set, is a bit of a re-invention. Only parts of the original survive but the story is known: It is the crucial moment when the unicorn lays its head in the maiden's lap. Obviously, tapestry weaving is not a common skill these days. The ladies we met belonged to one of only two studios in the UK which could carry out such work. Just looking at them working, it was clear how much skill, experience, precision and endless patience goes into a project like this. Just imagine: the daily target for the work on this project is about 10 centimeters square. And you can see in my pictures how big these tapestries are. And they are not 'just copying' either. They constantly have to decide on when to change to what colour and invent their own intervals, because of the change in scale. Unfortunately, I didn't take pictures in the weaver's workshop because I was too busy looking and listening. This is impressive, fascinating stuff. I can tell you that the tapestry is woven on a big vertical loom, on its side. That way, it won't sag out under its own weight later. This is also how it would have been done by the weavers in the past. What isn't historically correct is that they are weaving the image from the front. However, these weavers were trained like that and it has the added benefit (for the part of the work that's carried out on site in Stirling) of actually giving visitors something to look at while the work is in progress. The work has been going on for the past 12 years and it should be finished by the end of this year. I'm back in the Netherlands after two wonderful weeks in Scotland. We were extremely lucky to have great weather for all but two days (in fact, the first week and a bit were so warm and sunny, we thought we would run out of summer clothes. E did. The two souvenir t-shirts he bought have been worn already). I always thought we would like Scotland as a holiday destination but oh my, 'like' doesn't even begin to describe it. I fully understand it may be a bit harder to love the place when it's shrouded in its more usual garb of fog and rain, but what's not to love about a country where the rich history is served up in thick slices and every turn in the road reveals a whole new, stunning view? 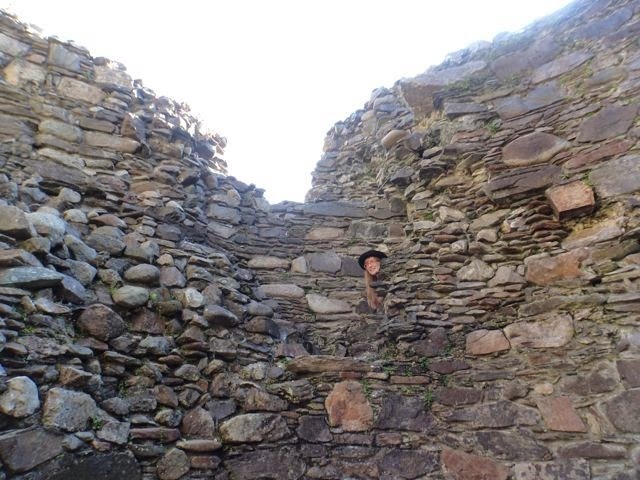 First of all: If, like me, you like history and enjoy exploring castles, ruins and country houses it's always worth checking (even before you travel) if there are any package deals available which will save on your admission fees. In the UK, the vast majority of historic sites is cared for and run by large charities and as a member you don't have to pay admission. On previous holidays in England, we've had short-term memberships of the National Trust and English Heritage, depending on the sites we wanted to visit. 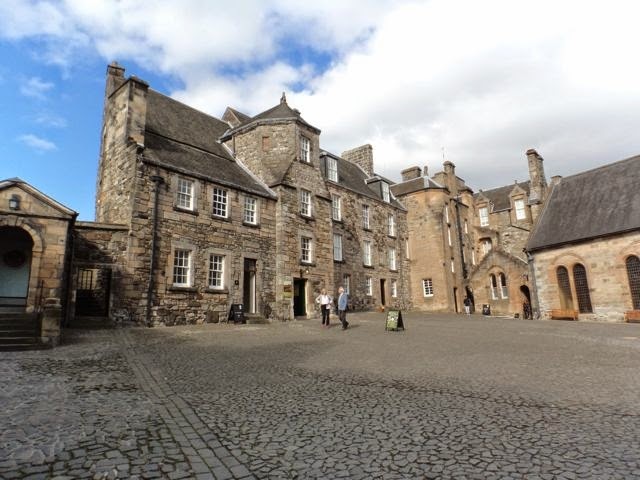 This time, Historic Scotland was the obvious choice, since the castles at both Stirling and Edinburgh (both major tourist destinations we were planning to visit anyway) are in their care. They offer an 'Explorer pass' for tourists and/or occasional visitors but we opted for the full membership. That way, we also got to see other sites, like the amazingly located Kilchurn castle (this is actually and unmanned property so you don't have to pay admission but there are many other castles where being a member will save you money). Oh, and even if you don't want to join, it's worth taking a look at their free app. It helps you find historic sites near you and you get the latest news about those. Like events. I didn't expect much from those but we were very impressed with the, rather modest, 'meet the redcoats' event at the grim little tower house of Corgarff. This was not some silliness for children but a very interesting display by nice, knowledgable and skilled reenactors (costume post in the coming week). Secondly: It's hard to visit Scotland and not see or do anything related to whiskey. E likes whiskey, so I had in fact planned on visiting a couple of distilleries. I can recommend it though. Although the vast majority is now owned by big companies, plenty of them are still at their historic sites and there is still clear craft and skill involved in the production of this stuff. And that is something we can all relate to. 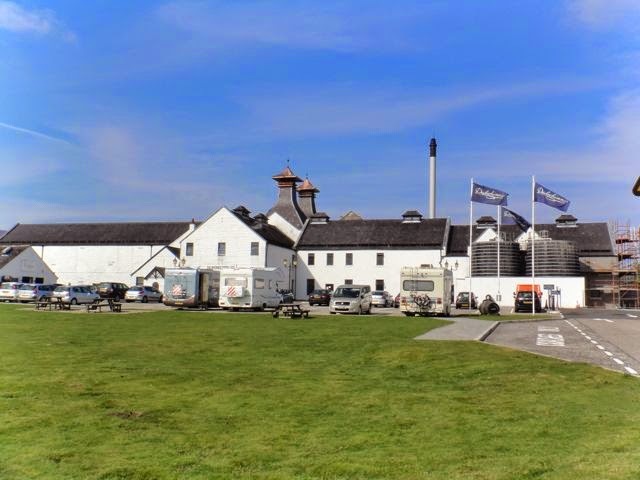 In a lot of hotels and guesthouses (especially in the Speyside region) you can pick up booklets with lists of distilleries which are open to visitors (including opening hours and cost of a tour). At some large ones, tours are free but if you're not obsessed with whiskey, a tour at a small facility is much more fun. This is the Dalwhinnie distillery, located in the middle of nowhere (Ok, next to a very small village) on a kind of plateau in the Highlands. If you go there, you can sign up for another club called 'friends of Malt Whiskey' (which is free). This basically means you can do the tour at the other distilleries which are owned but the same company for free. We did this and ended up visiting several. Out of those, I would recommend Royal Lochnagar. A small distillery next door to Balmoral palace with the most enthusiastic, nice and knowledgable tour guide of all. Of course, there are more guides than just the one we met, but they limit the amount of tours each guide does per day to three to allow them to be spontaneous and personalize the tours. Which has to be a good thing. I suppose you are all familiar with Spoonflower. What's not to love about a company which allows you to upload your own designs and have them printed on fabric? With a minimum amount of ehh... a swatch? And allows designers to sell their prints so you can also take your pick of original creations from talented individuals (often not professional print designers) from all over the world? Ever since I first heard about it(which was not very long after the launch of the site), I have been kind of following Spoonflower. Since then, the range of fabric you can choose from has increased massively, now also including things like sportswear fabrics (Melissa has really gone to town with that, creating coordinating prints in one yard of fabric for her work-out patterns) and organic cotton. And early complaints about the quality of the printed fabric seem to have vanished. I've voted regularly in the weekly contests, always enjoying the mass of creativity exhibited there. However, I have never actually participated, or even ordered fabric myself. Some other European sewers don't seem to mind, but I've always found the shipping costs from the US a bit too steep. Which I don't think is Spoonflower's fault at all. It's just a long way to ship things. Now, if they could only open up a European branch.... A girl can dream, right? But creativity isn't limited by constraints of distance or money... And I thought it would be good to practice my self-taught Illustrator skills a bit more. So, I've decided to enter those Spoonflower weekly contests of which I like the theme. Last week, I entered my first design. 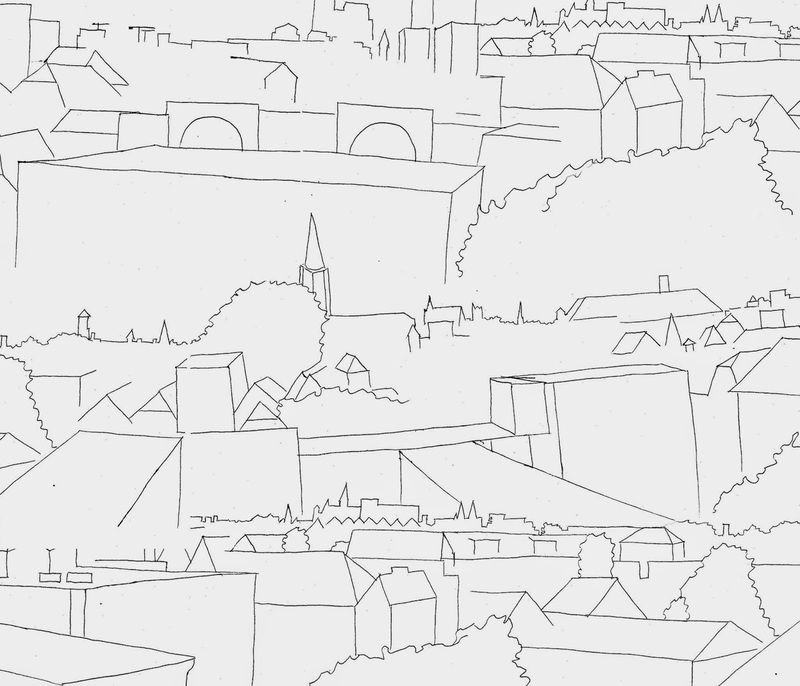 The theme was "neighbourhood" and designs had to be in black and white and in a hand-drawn style. Which kind of messed with my Illustrator goals. I took pictures of the view from the back balcony of my apartment, printed them, taped them together to form a panorama, put tracing paper over it and traced the outlines of the buildings and the trees, cut that up, scanned the images and then puzzled them together in Photoshop to form a single image of the size needed. And to be honest, I couldn't for the life of me figure out how I could create a proper repeat in such a haphazardly constructed thing, so it doesn't have any. Which is really bad for a print. And yet, I'm weirdly proud of it. It's called "the world from my window" and has received 'favorites' and even a very nice comment (I didn't even know you could do either of that on Spoonflower). My second design, which I submitted today, is for a contest with the theme "library", which doesn't have restrictions about colours or technique. This one was made in Illustrator, using a photograph I took at my local library. And the repeat works. It may be a more conventional design, but I like it. 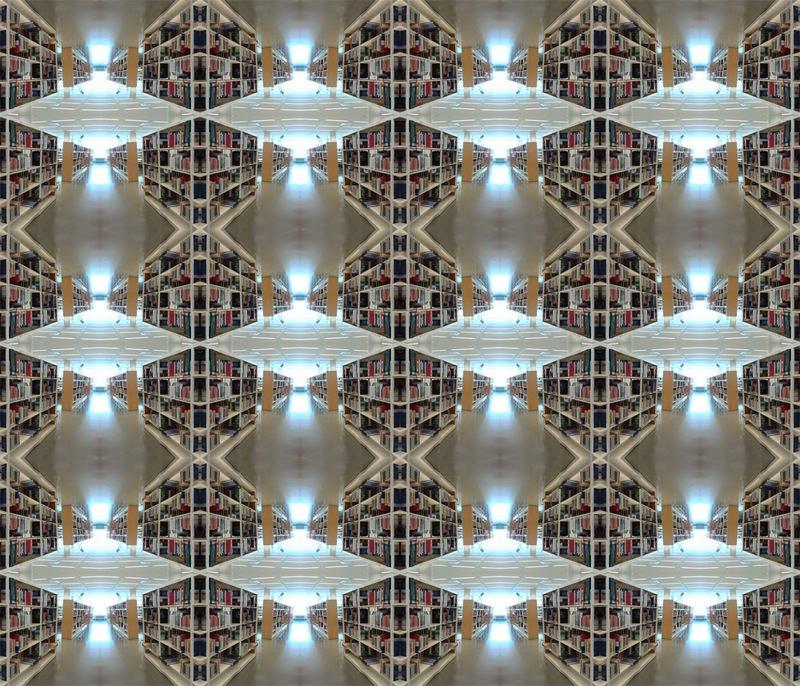 A real, unmanipulated picture which has become a rather abstract print which almost has the look of a woven design. This is print I could imagine sewing with myself. And it should be in the contest on Thurday. P.S. I think this speaks for itself, but I'm mentioning it anyway: This is just my opinion, I'm not in any way 'motivated' to write posts like this by Spoonflower or anything else and obviously, I'm not asking you to vote for me.